01. Groomers Best 48" Walk-Thru Tub w/Pull Ramp, Faucet Kit, Grate, Bottle Holder. PKG Deal! 04. Groomers Best 48" Walk-Thru Pettub w/Clip Ramp, Faucet, Bottle Holder, Grate. PKG Deal! 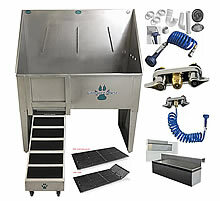 Groomers Best 48" Walk-Thru Tub w/Pull Ramp, Faucet Kit, Grate, Bottle Holder. PKG Deal! Ask a question about the: Groomers Best 48" Walk-Thru Tub w/Pull Ramp, Faucet Kit, Grate, Bottle Holder. PKG Deal! Solid Stainless Steel Walk-through Tub with Pull Out Ramp. The walk through design made with a pull out, push in ramp system making transporting animals into the tub much easier on groomers and pets. The ramp pushes straight back under the tub giving you completely free front space to work in and when needed, pull the ramp straight out. The tub will have 3 port holes so you can use a 4" faucet or an 8" faucet. It comes with stainless still plugs that matches the tub stainless so you can plug the port hole that is not being used. Made of 20 gauge 304 stainless steel for durability, and will never rust! Strong, durable and versatile. High back and sides protect against splashed and shaken water. The tub will have 3 port holes so you can use a 4" faucet or an 8" faucet. It comes with a stainless still plug that matches the tub stainless so you can plug the port hole that is not being used. Note on Water Ports: The tub will have 3 port holes exactly centered on the back wall for a 4" or 8" on center faucet. If you use a 8" on center faucet then the faucet will be centered because you will be using the outer 2 port holes. If you use a 4" on center faucet then you will be using the 2 right or left port holes. The same happens when you choose right side or left side water ports and using a 4" on center faucet. **See below for additional items to purchase for this bathing system. - Full Backsplash Length: 37"
How do I choose where I want my water ports and drain? Imagine yourself standing, facing the front of the tub. Your right hand will be on the right side of the tub and your left hand will be on the left side of the tub. This is how you choose the water port and drain location to your needs. You do same same to choose your ramp location. Door Size: 13" x 10" - Fits securely in walk thru opening. 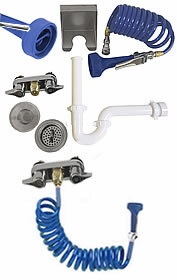 Faucet, hose, sprayer, hair trap, drain and vacuum breaker. Quality Self Installation Kit. 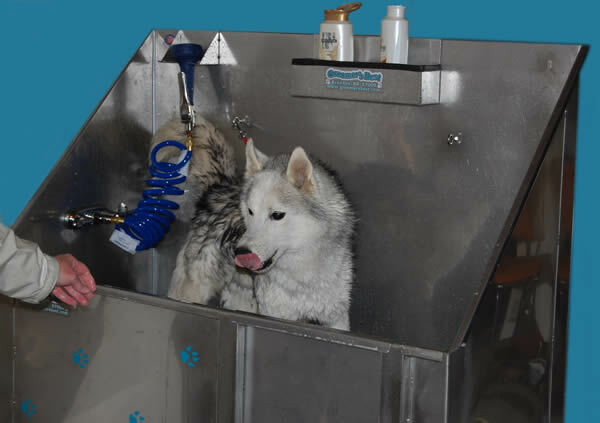 Eliminate the need to purchase plumbing parts for your Groomers Best pet tub! Plumbing kit is designed specifically for all Groomers Best Pet Tubs. 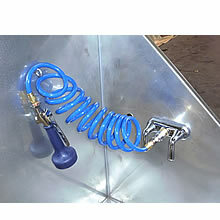 All you will need to do is hook your plumbing to the Groomers Best Plumbing Kit and your ready to go. The heavy duty coiled hose is 3/8" thick is about a foot long and stretches to 9 feet. The straight nozzle releases a jet spray. The lever can be held down or hooked down so you don't have to hold it down yourself. When you release the lever, the water flow shuts off completely. So there is no need to turn water off. Floor grate made from heavy duty high density polyethylene plastic will not rust and provides a raised flooring to keep dogs' feet out of the shampoo suds, water and debris. The floor grate is available with no hinges (one full piece) or a hinged grate, which makes it so easy to clean out your drain. The hinged grate is hinged in the middle. One side lifts up. Much more convenient to keep your drain free of hair and debris. Designed for Stainless Steel Pet Tubs. Though it can be used with any pet tub. Solid 20 gauge 304 stainless steel. Holds four 32 ounce bottles. A customer of ours that purchased this Dog Bathing System sent us this photo introducing "Kilmer" bathing for an upcoming dog show in a Groomers Best 48" Pet Tub!